But with Goldman Sachs and Soros destroying one country after another, they do not stand a chance. By now we are all Palestinians. David Icke knows it and he is not alone!!! The following pathetic video was produced by the Campaign Against Antisemitism, an Israeli Hasbara unit operating in Britain. This video won’t hurt David Icke. Instead, it proves once again that Jewish power is the ability to silence discussion on Jewish power. This power is proving less effective by the day. The election of Donald Trump has sent millions of people pouring out onto the streets to protest a man they think is a racist, misogynist, xenophobic bully who will destroy US democracy in his quest to establish himself as supreme fascist ruler of the country. Can we agree that there is at least the appearance of hypocrisy here? He’s right, isn’t he? How many of the 800,000 protesters who marched on Sunday would have flown to Washington to express their contempt for would-be President Hillary Clinton? Zero, I’d wager, and yet it’s Hillary who wanted to implement the no-fly zones in Syria that would have put Washington in direct confrontation with Moscow, just like it was Hillary who wanted to teach Putin a-thing-or-two in Ukraine. But is that what the people want? Would people prefer to be led into World War 3 by a bonefide champion of liberal values than concede the post to a brassy billionaire who wants to find common ground on fighting ISIS with his Russian counterpart? It seems like a no-brainer to me. And it’s not like we don’t know who is responsible for the killing in Syria either. We do. 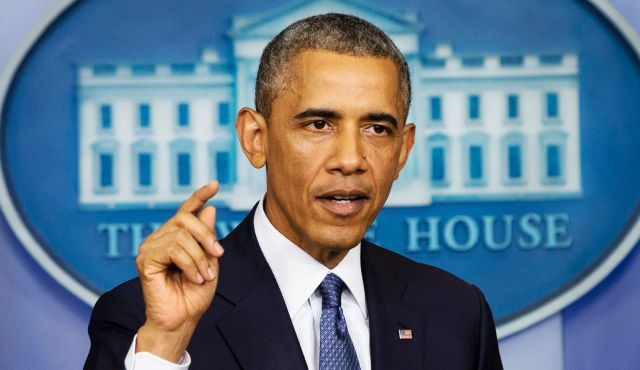 Let’s be honest, Obama got a pass from his supporters strictly because of appearances; because he looked and sounded like a thoroughly reasonable bloke who only acted on the loftiest of principles. Obama was hailed as a moral giant, a political rock star, a leader among leaders. But it was all fake, all make-up and glitz behind which operated the vicious national security state extending its tentacles around the world, toppling regimes wherever it went, and leaving anarchy and destruction in its wake. Isn’t this Obama’s real legacy when you strip away the sweeping hand gestures and pompous rhetoric? Of course it is. But Trump won’t have that advantage, will he? Trump is not a public relations invention upon which heartsick liberals pin their highest hopes. Trump is Trump warts and all, the proverbial bull in the china shop. That’s not to say Trump won’t be a lousy president. Judging by the Wall Street cutthroats and hard-edged military men he’s surrounded himself with, he probably will be. But the American people are no longer asleep, so there’s going to be limits to what he can hope to achieve. So the question is: How should one approach the Trump presidency? Should we denounce him as a fascist before he ever sets foot in the Oval Office? Should we deny his “legitimacy” even though he was elected via a process we have honored for over 200 years? Should we launch impeachment proceedings before he’s done anything that would warrant his removal from office? “The current danger for Democrats and progressives is that – by bashing everything that Trump says and does – they will further alienate the white working-class voters who became his base and will push away anti-war activists. Right on, Bob. A very reasonable approach to a very thorny situation. 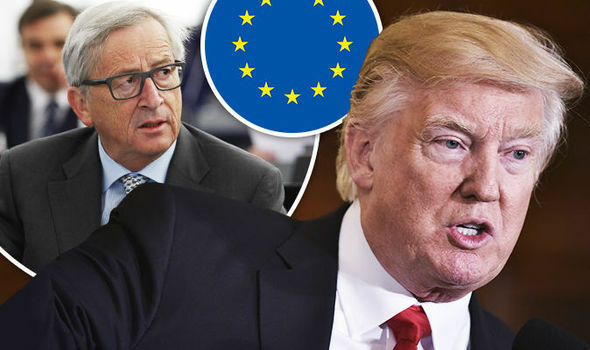 DONALD Trump has taken a swipe at the European Union by blasting the bloc as a “consortium”. 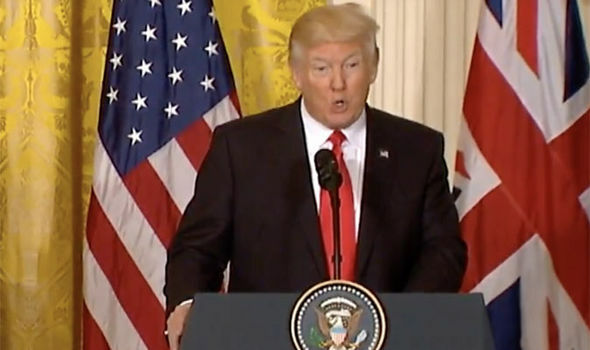 He made the stinging jibe during a joint press conference held in Washington with Prime Minister Theresa May. 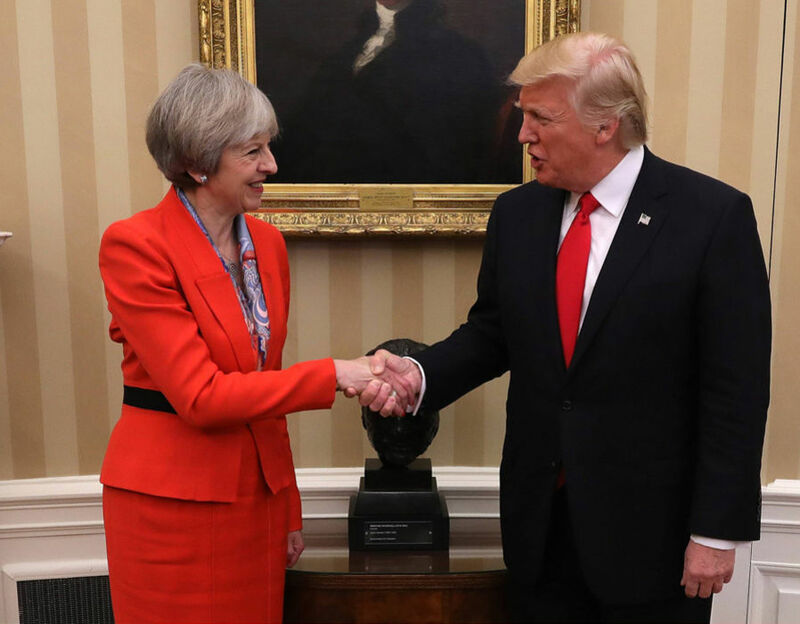 Mr Trump described brexit as a “wonderful thing” and said it hinted at his shock victory in the US presidential election some months later. He blasted the EU while discussing his attempts to be approved for a development in a European country – presumed to be Ireland, where he owned a development on the west coast but was denied permission to massively expand it. The two leaders will spend about an hour in face-to-face talks in the Oval Office, where President Trump has restored a bust of Winston Churchill removed by predecessor Barack Obama. The December 9, 2016 Kremlin celebration of the Fatherland Heroes’ Day brought attention to one of obscure components of Russian clandestine paramilitary capabilities, when a photo featuring President Vladimir Putin and the leadership of the so-called Vagner Private Military Company surfaced on social media. Vagner is the pseudonym of Dmitriy Utkin, a retired member of the Russian Armed Forces who at the time of his discharge commanded the 700th Special Operations Detachment of the 2nd Separate Special Operations Brigade of the Main Intelligence Directorate of the Ministry of Defense. He has gained experience in PMC operations while employed by the Moran Security Group where he participated in Somalia counter-pirate operations. Vagner’s deputy commander is also a Russian military veteran, Vadim Troshev. Vagner represents Russia’s most ambitious experiment with the PMC concept. Elsewhere in the world, PMCs such as the Executive Outcomes and Erik Prince’s original Blackwater, which began as corporate security outfits, have evolved into de-facto extensions of national military power, occupying the niche between covert action and the deployment of regular special operations and elite forces. As of this writing, the Russian government has not yet adopted a clear policy concerning the existence of PMCs in Russia. While a bill was introduced before the State Duma that would have provided a legal framework for Russian PMCs, it was tabled after some discussion. It would appear that the Russian government is in a “wait and see” mode, and the ultimate decision will depend on a number of factors. The first is the nature of Russia-West relations in the era of Trump, Brexit, and prospective wins by anti-globalist parties in the EU. Should the relationship evolve in the direction of cooperation rather than confrontation, it would reduce the need for PMCs. The second factor is the Syria experience, which is the the largest and most overt demonstration of the Russian PMCs to date, even though PMCs have been employed in achieving Russian state objectives for over a decade. Their usefulness has been demonstrated in Crimea and the Donbass, where a high number of quasi-PMCs were incorporated into the general concept of operation in order to fulfill missions that could not be performed by the Novorossia militias or regular Russian military forces for military or political reasons. Syria is not only a more protracted and high-intensity operation, but also an opportunity to evaluate the relative advantages and drawbacks of relying on PMCs, as opposed to regular special operations forces and other elite formations. In that respect, Syria shows the evolutionary maturation of the PMC concept that gradually came of age during various operations in Central Asia, Caucasus, Crimea, and Donbass. In contrast to the US experience which adopted a top-down model of PMC use, the precursors of the current Russian PMCs arose spontaneously, in response to market demands, as it were, both around Russia’s borders and around the world, and which tapped into a large pool of trained veterans of Afghanistan and Chechnya. Ironically, Russian PMCs owe a lot to the United States or other Western powers which used Russian “privateers” in a variety of operations, including in Iraq. Even Vagner’s operations in Syria are the result of Dmitriy Utkin’s initiative. It is only in the last few years that the Russian Ministry of Defense decided to weave PMCs into the broader array of forces at its disposal, and Vagner’s effectiveness has provided an additional stimulus toward formally institutionalizing the relationship between PMCs and the Russian MOD. Since Vagner’s existence or participation in the Syria operation has not been officially acknowledged, there are no reliable reports on the number of Vagner operators or the functions they perform. Some estimates run into as many as 400 operators in the country where they are more likely to see frontline combat than the active duty Russian troops. Vagner also suffered an unspecified number of casualties, including fatalities. Finally, there is the question of what relationship will exist between the PMCs, the covert operations community, and the special operations formations on which the PMCs will naturally rely for recruits. The heavy US reliance on relatively undisciplined security contractors during its infamous Global War on Terror had the effect of increasing the death toll among the Iraqi and Afghan civilians who perished at the hands of PMC operators who were not accountable to either US or local laws, and of provoking an outflow of trained cadres from the US special operations units who opted for the far higher salaries and personal freedom that the US PMCs offer. What that formalized relationship will look like may never be publicly known, for there are good reasons to maintain a certain level of secrecy surrounding what is, after all, an instrument of clandestine paramilitary action, which may also be a reason why a PMC law has not been formally adopted. However, considering that Vagner operators have received high military decorations for their contributions in Syria, it appears that Russian PMCs are here to say, and that they will enjoy a high level of prominence in the future. The recent talks with Libyan military leaders aboard the Admiral Kuznetsov suggest that Syria is not going to be the last battlefield for Russian PMCs. Lots of confusion about the infighting in the “rebel” held Idleb governate in Syria, the situation is now clearing up. After other tricks, like renaming the group, did not work to deceive al-Qaeda finally pulled back the veil. It is no longer hiding between the “moderate rebels” but is now (again) a clearly identifiable groups. Groups near to al-Qaeda integrated with it, other groups split with significant parts joining the al-Qaeda organization. The Zinki (Zengi) group had CIA support and received anti-tank weapons from the U.S. and its Gulf proxies. JFS is the short form of Jabhat Fateh al-Sham, formerly Jabhat al-Nusra, the official al-Qaeda group in Syria. It is the strongest “rebel” group on the ground. Abu Jabar is a former Ahrar al-Sham leader who had long argued for integrating both groups. The Turkish and U.S. supported Ahrar al Sham has now officially split. The probably larger part under Abu Jabar is now joining al-Qaeda. The “new” Tahrir Al-Sham is not a coalition of the various groups but THE new al-Qaeda group on the ground with a unified command and ideological structure. The operative military leader is Abu Jabar while the founder of al-Qaeda in Syria, Abu Mohammad al-Julani, will stay in the background as the overall emir of the group. Tahrir Al-Sham has a military alliance in Idleb with the smaller local ISIS group Jund al-Aqsa. Joining with them is not (yet) convenient. The now further enlarged al-Qaeda formation under the new name Tahrir Al-Sham is by far the biggest “rebel” dog in the Idleb-region town with now many more than its previous 10,000 active fighters. Of all other groups the “moderate” side of the split Ahrar al-Sham is the biggest one. Left beside it are just splinters of those groups (like Zinki) that mainly crossed over to al-Qaeda. Some local warlords and their small gangs are also still around. These groups will probably continue to receive Turkish and U.S. support. But they will have no chance against the much more powerful al-Qaeda collective. The leader of al-Qaeda in Syria al-Julani made a huge mistake by initiating this open split from the “moderates”. The group can now no longer hide by “mingling” with the CIA supported “moderates”. When it is attacked by the Syrian government it can no longer claim to be a victim. As it is a UN designated terrorist group it will receive no significant outside support. It can not even go into guerrilla mode because the “fish” (the guerrilla) will have no “water” (a sympathetic local population) to swim in. This plays well into the Russian hands which initiated the Astana peace conference exactly for this purpose. 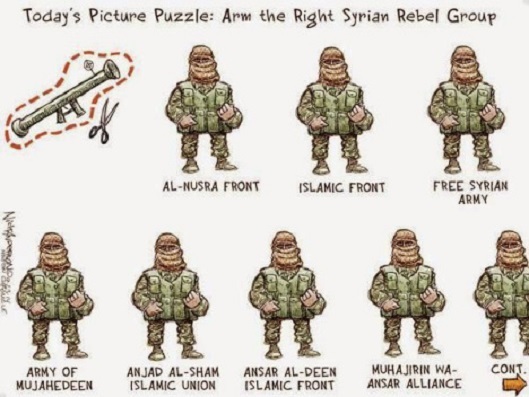 The U.S. under Obama and Kerry had declared it impossible to separate al-Qaeda in Syria from the “moderate rebels” it supported. The Astana conference and in its consequence the now open al-Qaeda conflict with the “moderates” achieved the separation. The “moderates” left now can only join al-Qaeda, make peace with the Syrian government and its allies or flee the country to survive. In other news the Syrian government forces have finally recaptured the Ayn al-Feejah in Wadi Barada that supplies Damascus with drinking water. 5.5 million people were cut off from tap water when the Takfiris captured, poisoned and blocked the spring 44 days ago. After three earlier deals had failed the now defeated Takfirs agreed to being transported to Idleb. President Donald Trump and Saudi King Salman want to “rigorously” enforce the Iran nuclear deal, the White House said Sunday, despite the US leader’s long opposition to the agreement. 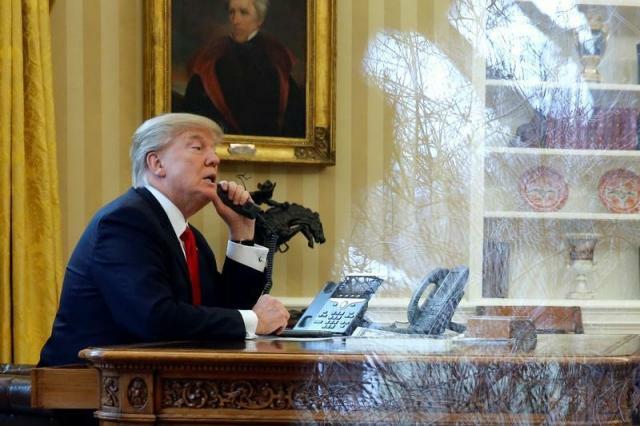 The pair, in a phone conversation, also spoke of the need to address Iran’s “destabilizing regional activities,” fight the spread of “radical Islamic terrorism” and establish safe zones in war-ravaged Syria and Yemen, the White House statement read. No further details were provided about those plans. The official Saudi Press Agency early on Monday confirmed that Trump had called Salman. SPA said Trump and Salman also agreed on “formulating the appropriate mechanisms” for countering “terrorism” and extremism. Salman and Trump invited each other to visit their respective capitals, the Saudi Press Agency said. “The two leaders agreed to schedule the visits in the coming period”, it said. Trump and King Salman “agreed on the importance of rigorously enforcing the Joint Comprehensive Plan of Action with Iran and of addressing Iran’s destabilizing regional activities,” the White House said. Trump also spoke by telephone with the crown prince of Abu Dhabi, Mohammed bin Zayed Al Nahyan, committing to “further strengthen cooperation on fighting radical Islamic terrorism,” the White House said. The United Nation’s aid chief has warned that Yemen is facing the risk of all-out famine this year… Warning, you may find the images in the follwing reports disturbing.